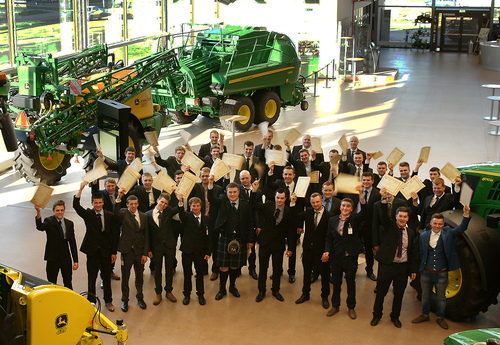 John Deere has also been listed for the first time as one of the best 100 employers for school leavers in the UK, the only agricultural and turf machinery company to be so recognised (for the full list, click here: www.allaboutschoolleavers.co.uk/employer-rankings). Three of the company’s apprentices won overall awards for the 2016 graduation year. Jack Robbens of dealer Ben Burgess, Norwich was named Ag Tech Apprentice of the Year, for which he received a crystal plaque, a certificate and vouchers for workshop tools worth £250. Lewis Parker of Mona Tractors, Llangefni was awarded Turf Tech Apprentice of the Year and Grant Roberts of Cornwall Farm Machinery, Penzance won Parts Tech Apprentice of the Year. Both also received a crystal plaque and certificate, and the same value workshop tools and shopping vouchers respectively. The presentations were made by Deere & Company’s Region 2 training delivery manager Dr Lutz Schueppenhauer and John Deere Limited training centre manager Richard Halsall at the John Deere Forum visitor centre in Mannheim, Germany. They took place during the apprentices’ annual graduation visit to the company’s tractor and cab factories and European Parts Distribution Centre (EPDC). John Deere’s three-year Ag Tech and Turf Tech and two-year Parts Tech apprenticeships lead to IMI Level 2 & 3 Diplomas in Landbased Engineering, and registration at LTA2 level in the industry’s Landbased Technician Accreditation scheme. In subsequent years qualified technicians undergo further education and adult training within the John Deere University programme, on a career path that can ultimately lead to the highest possible LTA4 Master Technician accreditation. Now in its 25th year, Ag Tech was the first such scheme to be introduced in the UK and won a National Training Award at the end of 1997, the only one ever made to an agricultural machinery apprenticeship programme. Since the first programme started in 1992, nearly 700 apprentices have graduated through the three main John Deere schemes (Ag Tech, Parts Tech and Turf Tech) and are now working in the company’s nationwide dealer network. The John Deere and ProVQ schemes were recently included in the 2017 School Leaver Awards, in recognition of the programme’s quality and the opportunities it presents to young people working productively in the agricultural and turf sectors.